Saturday afternoon, the Syracuse offense displayed what Dino Babers’ offensive scheme is supposed to for almost three quarters. The only problem with that was Wake Forest did an even better job of doing it. The Demon Deacons (6-4, 3-3 ACC) were held in check for the second quarter, but otherwise shredded the defense of the Orange (4-6, 2-4), piling up 734 yards as they set a Carrier Dome record for points by an opponent in a 64-43 victory. 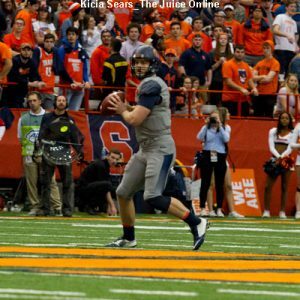 SU was no slouch on offense, amassing 621 yards of offense and their highest point total since the season opened against FCS Central Connecticut State with Zack Mahoney replacing injured quarterback Eric Dungey, but they simply could not stop Wake with any consistency. The 1,355 yards of combined offense by the two squads set an ACC record. Syracuse forced four consecutive punts from late in the first quarter to late in the second quarter, but the Demon Deacons scored on every other possession in the game save for a muffed punt and downing the ball at the end of the game. Aside from two late scores set up by an interception and a turnover on downs, every Wake Forest scoring drive covered at least 45 yards and only one touchdown drive required fewer than 63 yards. The game had a shootout feel from the jump. After SU’s Cole Murphy missed a 45-yard field goal on the opening drive of the day, the two teams combined for five touchdowns before the first quarter ended. Dontae Strickland’s 43-yard touchdown run around a wide open left side of the Wake defense got the Orange on the board and Murphy’s extra point knotted the game at seven. The next Syracuse possession cashed in when Zack Mahoney floated a beautiful play-action pass to tight end Ravian Pierce behind the defense for a 19-yard score. Murphy’s conversion made it 14-all. Wake scored on their next drive for a 21-14 lead with 2:27 still left in the first. The Orange needed two possessions to score again. This time, Chris Elmore bulldozed through the Demon Deacon defense from a yard out and Murphy tied the game with his extra point. The SU defense forced their second straight punt and the offense took advantage once more, driving 77 yards for a score. Steve Ishmael got into the act as has done so frequently this season. The senior wide receiver beat his man on a stop-and-go move on the right side, then fought through defensive pass interference to snag a 30-yard touchdown pass from Mahoney while falling to the turf for the first Orange lead of the day. Murphy’s kick made it 28-21 with a shade over nine minutes left in the first half. Syracuse continued piling up points before the half, as Murphy capped the next drive with a 30-yard field goal from the right hash to make it a 10-point Orange lead with just over three minutes left in the half. The next SU possession ended in a punt, but when a teammate collided with the Wake Forest punt returner, the ball caromed off the returner and Andrew Armstrong recovered for the Orange at the Deacons’ 26. Three plays later, Mahoney tossed an 18-yard play-action touchdown pass to Pierce, one shy of from being a carbon copy of their first scoring connection. Murphy’s kick made it 38-21 with 16 seconds before the break. With a pair of time outs, those 16 seconds were enough time for Wake to get into field goal range and their 41-yard field goal as the clock expired was true, clipping the halftime margin to 38-24. Each team posted a field goal on their opening possession of the second half with Murphy’s 47-yarder reinstating SU’s 14-point lead. The kick was his 19th field goal of the season and the 58th in Murphy’s career, setting both the single-season and career records for field goals for Syracuse. And then Wake took over. The Deacons wrapped two long scoring drives around an Orange punt. The only thing keeping SU in front was Chris Slayton blocking the second extra point try and Scoop Bradshaw returning the ball the length of the field for two points. 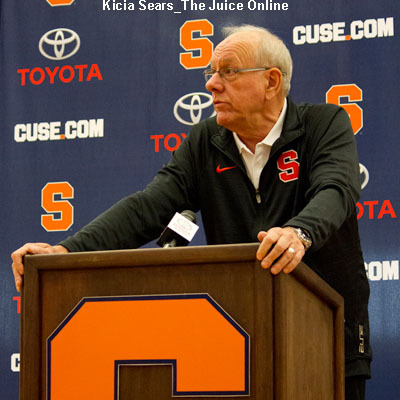 The Carrier Dome crowd roared their approval as Syracuse boosted their lead to 43-40. Looking to double their hold on the game, Syracuse settled for a 51-yard field goal try from Murphy, but his kick stayed well left of the uprights. Wake’s offense continued to roll, as they cashed in another touchdown and went up, 47-43. Mahoney prematurely ended the next Orange possession with an interception. The long return that Wake a short field and five plays later, the guests were celebrating another touchdown and a 54-43 lead. 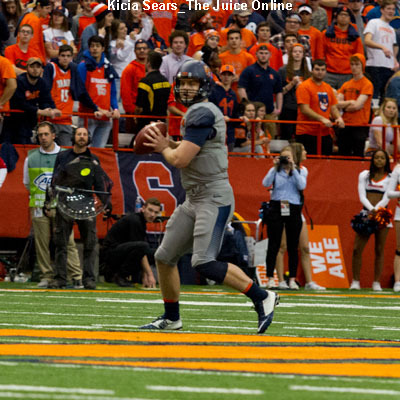 Desperate to keep pace with under seven minutes on the clock, Babers kept the offense on the field on fourth-and-five at the SU 30. In a peculiar decision, he subbed in Rex Culpepper for Mahoney and his incompletion gave the Demon Deacons the ball and a short field. Wake tacked on a field goal to push their lead to 14 points. Mahoney returned to the game and led the Orange down the field, but his interception at the Wake 15 all but ended the game. A couple minutes later, despite being in clock-killing mode, the Demon Deacons added some salt to the wound when a simple handoff up the middle on 3rd-and-12 turned into a 76-yard touchdown run. With two minutes left, the extra point closed the scoring at 64-43. 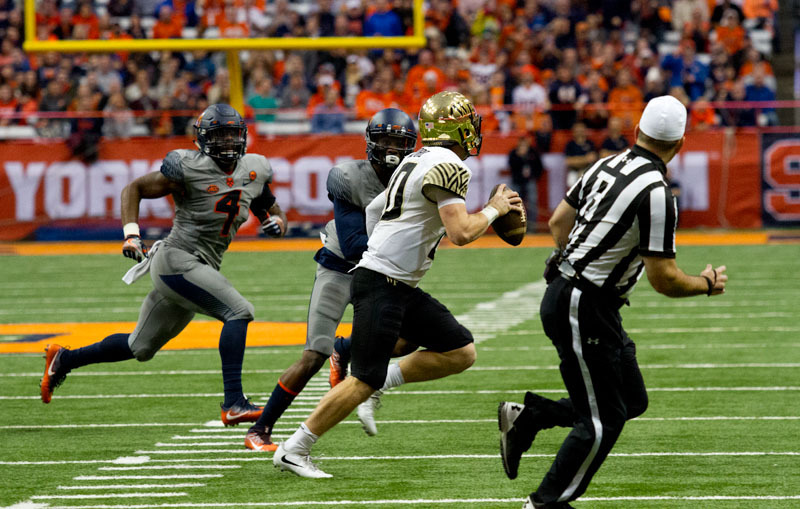 Pressed into duty by Eric Dungey’s injury, Zack Mahoney completed 33-of-60 passes for Syracuse, gaining 384 yards. Three passes went for scores while two were intercepted. Steve Ishmael had a huge day, catching 14 passes for 145 yards and a score, and now stands second all-time at SU in receptions (201) and receiving yards (2,530). Ishmael also become the fifth player for the Orange to clear the 1,000-yard mark in receiving. Erv Philips had a half dozen receptions for 93 yards and Ran Pierce had four grabs for 52 yards and a pair of scores. Moe Neal picked up 86 yards on a dozen carries. Zaire Franklin had 16 tackles, including a dozen solo stops, to lead the Syracuse defense. Andrew Armstrong had a fumble recovery and Alton Robinson had a quarterback sack. Wake’s John Wolford led a dynamic attack, throwing for 363 yards and three scores while picking up 136 yards and three more scores on the ground. Three different Demon Deacon receivers had over 100 yards and Cam Serigne caught all three touchdown tosses. Matt Colburn had a field day for the Deacs, running the ball 31 times for 237 yards and a pair of scores. With only two games left and wins in both required to ensure bowl eligibility, Syracuse will travel to Louisville next Saturday in desperate need of ending their three-game slide since the Clemson upset. The Cardinals (6-4, 3-4) have won two of their last three, including a 38-21 victory over Virginia on Saturday. Cards quarterback Lamar Jackson, who broke onto the national scene last season by shredding the Orange defense to jumpstart his Heisman-winning campaign, has already thrown for over 3,000 yards and run for nearly 1,200 yards on the season. Jackson has a hand in 36 Louisville touchdowns, as well. ESPNU will televise the game, which is set for a 3:30pm Eastern kickoff. The game will also be online at ESPN3.com.